Cabinet storage is a pain. We’ve all been there. You have to move the pot lids to get at the frying pans, and the saucepans are stuck under the lip of the cabinet. It becomes a wrestling match with the drawer and its contents, and you have to repeat the whole affair when it’s time to put the pans away again. 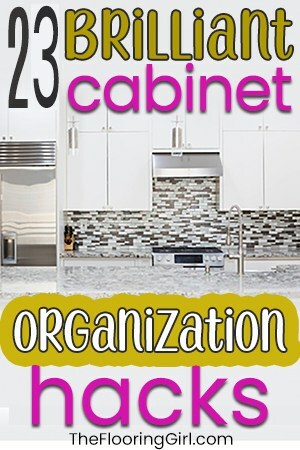 Give yourself a break from this frustration by capitalizing on these savvy and inexpensive cabinet organization ideas. You’ll never have to play tug-of-war with the frying pan again. When your space is limited to a single surface, upper cabinets can become over-cluttered. 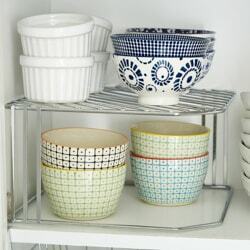 You can multiply your space by using suspended baskets that allow additional storage beneath every shelf. These polytherm baskets blend the look of chrome with the protective nature of vinyl to ensure your storage solution is both elegant and practical. 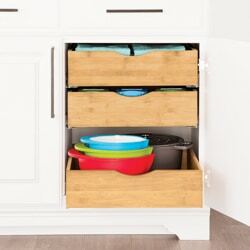 Beyond that, increase your cabinet floor storage space by adding shelving inserts. These epoxy coated wire shelves come in various sizes and allow for extensive use of space. Be sure to pick the right shelf for your purposes, as some of these shelves might not hold up to the heaviest of uses. If you’re having trouble getting started or prefer not to do it piecemeal, this starter kit is an excellent way to increase your storage space while saving on shipping. 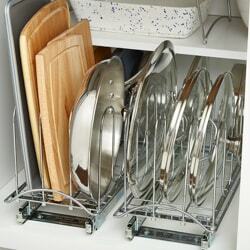 It includes a stemware holder, two chrome shelves and an under basket that is perfect for small stacks of plates. If you want to take your upper cabinet organization up a notch, consider this MEETGG hanging basket. 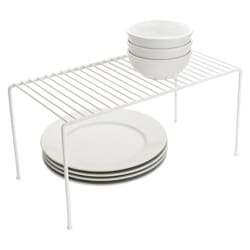 This piece is incredibly versatile and can be used for drying dishes or storing inside the cabinet. 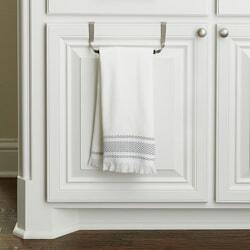 It features a front-loading basket and two long hooks that can be used for hanging mugs, dish towels, or paper towels. Reclaim that lower territory and win the fight against the pan lids by installing a lid holder. These unique chrome organizers are a life saver. This holder also fits great with frying pans, cutting boards, and cookie sheets. Top it all with a cupboard shelf or two (from above), so that those smaller or highly used pans don’t get lost in the shuffle! 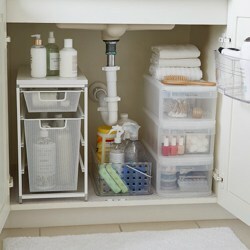 A starter kit is a great way to go with lower cabinet organization ideas as well. Get everything you need to get started. This kit includes a pull-out drawer, two pot lid holders (one that pulls out and one that is fixed), and two chrome cupboard shelves. I love this kit because it gives you all you need to get started, and you can always split it between multiple cabinets if you lack space or need inside a single cabinet. If you want to keep it simple and stylish, a great alternative is to convert that big open space into a set of drawers. These bamboo roll-out cabinets are excellent for bringing all that open space into arm’s reach. As with most of these ideas, you’ll also have the ability to further divide these drawers into organized space using some of the tips mentioned in my section regarding junk drawer organization (below). You can also consider professional grade slide out cabinet organizers, which feature a quality construction of steel and chrome. 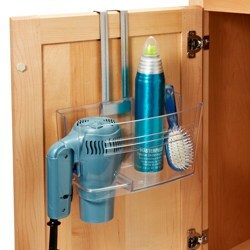 These organizers are particularly powerful given their patented ProGlide ball bearing system and easy mounting. Few things are so frustrating as having junk piled at the front of a corner cabinet, making it impossible to reach things in the back. This is easily one of the most forgotten spaces in the kitchen. 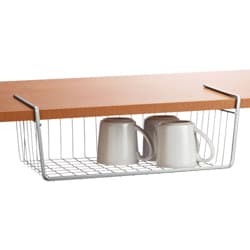 This chrome corner shelf is perfect to raise small but often used items up above the clutter. 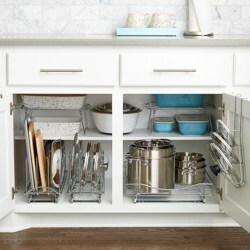 Reorganize your corner cabinet by creating tiers in the back for least used items. You can then use space immediately inside the cabinet or at the front of your turntable for most used items without burying the things at the back. If that doesn’t work for you, try some great pie-shaped organizers that allow you to add order to the chaos. These wire frame wedges are perfect for equally dividing the space on your turntable. They are designed to maximize the space, and their steel construction will hold up to the years. The cupboard under your sink can get scary. We all do it. Rows of cleaning supplies get buried in grocery bags or sponges, and the offal tries to push its way out every time you open the doors. Get your heaviest hitters at arm’s reach by installing an under-sink caddy. This makes for a complete refund of space in an instant, and allows you to ensure that you never find yourself without that need-to-have item from under the sink. Be sure you know how much clearance you have to work with, as too little space may result in issues closing the cabinet. You can further diversify your space by installing a mesh drawer, allowing a convenient and compact place for all those extras. This tough epoxy-bonded set of drawers allows strength and flexibility, while the mesh bags give you full visibility of the contents without having to dig to the bottom. If you don’t feel up to working through your needs one piece at a time, take it all in one go with this under-sink kit. This kit includes plastic runner bins, a tote, some stacking drawers that can be mixed inside the runners, and a caddy, among other things. With this solution, you’ll never have to dig beneath the sink again! Far and above your every day fare, this under-sink organizer by Household Essentials will change your storage under the sink forever. 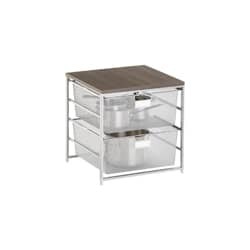 This organizer is professional quality and features commercial grade chrome wire. The ball bearings that power this workhorse will glide gently for years. Sometimes the best thing for your silverware drawer is to reduce to only what you need at any given time. It’s nice to wash less frequency, but having three or four mismatched sets of silverware in a single drawer is a bit much. Take some time to thin down your surplus. If you have multiple sets and want to keep them for style or theme reasons, consider moving the off-season sets into a storage chest. These storage chests are sleek and stylish, and will allow for a total refund of that space which is most precious to your kitchen drawers. You can put them in the basement or a storage closet in another area. 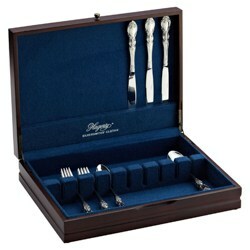 Once you’ve identified what stays, do yourself the greatest favor by installing a cutlery organizer. 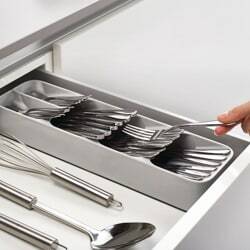 This will make maximum use of the space you have left, and you’ll find these organizers by Joseph a mind-blowing addition to your silverware drawer organization. There is no stopping the accumulation of small necessities that we all keep in that one easy drawer. I won’t have to tell you how the simple convenience of having these things within easy reach is soon outweighed by the sheer volume of stuff you have to pore through. 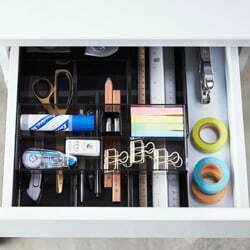 Bring some structure to the junk drawer by investing in this black expandable drawer organizer. The greatest thing about this organizer is that it is expandable. Not all junk comes in the same sizes, after all. The innovative design and substantial use of space make this organizer a vital addition to your junk drawer. If you want to consider your options, this set of interlocking organizers is great for a creative approach. These interlocking organizers come in various sizes and can be combined in almost limitless configurations! 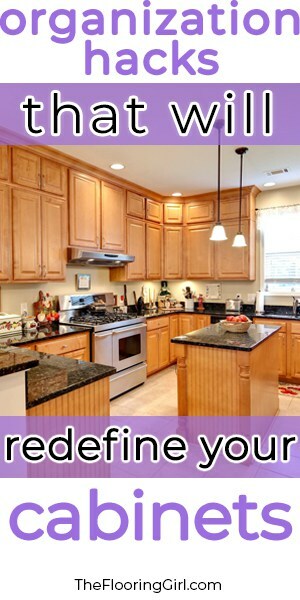 There are many things you can do to reinvent the space in and around all of these areas. Get creative with both space and surface by using these simple hacks. Make some extra room in your spice cabinet by using this multi-level expandable spice rack provided by InterDesign. This spice rack keeps a low profile while boosting your most used spices into the limelight. Nothing can be so overwhelming as a cupboard full of spices, so do yourself a favor and get one of these right now. 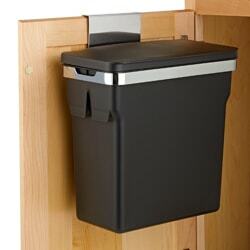 You can install an in-cabinet trash can for those spaces that tend to require keeping trash separate. These cans are a great way to divide disposable or expendable extras from permanent fixtures–grocery bags are a great example of this, whether kept for reuse or recycling. Insert a towel bar on one or many cabinet doors to ensure that you always have adequate space for an easy to reach dish towel. This is also a great way to ensure that all your seasonal decorative towels get plenty of showtime. Once again, be sure to check your clearance before you buy. 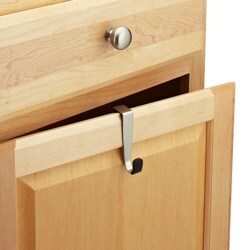 Find key cabinets for installing a cabinet hook. These small and versatile hooks are perfect for hanging an apron or dish brush. If you’re crafty, it’s also a great place for seasonal decor. Hang a few small wreaths during Christmas, or a few flower crafts in summer. If you have kids, this is an excellent place to show their arts and crafts without taking up valuable surface on the fridge. Don’t forget to take time to lay the appropriate padding or gripping surface along all your cabinet and shelf flooring. 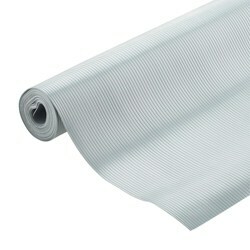 This ribbed shelf liner is perfect for allowing airflow and stability along all your cabinet surfaces. Airflow is important to prevent mold and mildew, and the soft material grips the bottom of our dishes to ensure they don’t slip when put down or jostled. It’s amazing how much these simple little organizing hacks can make life easier. Clutter can get to be an annoyance and of course slow you down. These simple hacks can help you find more space in your cabinets and reduce stress levels. Which is your favorite tip? Do you have extra hacks to share? We’d love to hear your creative solutions. Leave us a comment below. 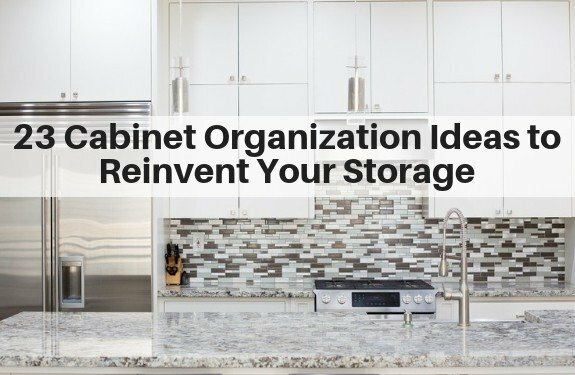 Thanks for these cabinet organization hacks! Our cabinets are always a mess and no matter how hard I try, I cannot seem to keep the storage organized. I will definitely be trying some of these tips! Linda – Oh good. I’m so glad to hear this info is helpful. Sometimes we don’t think about the clutter we have in our cabinets…until we open them. These tips will help things look nicer and save time as it will make it much easier to find the items you need.